Where Can I Find Free Wi-Fi in Los Angeles? Los Angeles, California, is a beautiful city with many mesmerizing and peaceful spots. The city is also rich in tech and free Wi-Fi hotspots. However, if you are thinking that every corner hosts a free Wi-Fi hotspot then you would be wrong in your assumption. 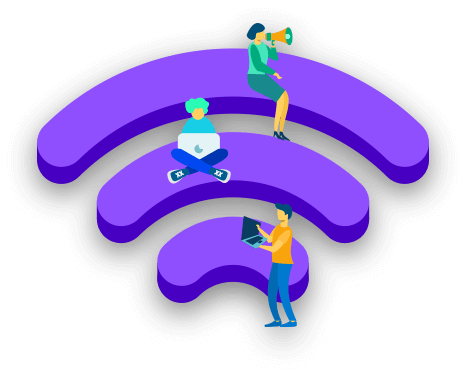 Taking it upon ourselves to make things easier for you, we have created this guide on how and where you can find free Wi-Fi in Los Angeles. Plus, you will also get to learn how you can safely conduct your work on these open networks without drawing the attention of cyber goons. Public Wi-Fi hotspots are not to be trusted, whatsoever. These are open networks where anyone can join, including hackers and snoopers. As a result, it isn’t just your social media profiles or email addresses that will be at a risk, but also your bank account details and other sensitive information. To fight an enemy, you must first learn more about the enemy and its tactics. By understanding more about the enemy, you will be able to protect yourself and take efficient countermeasures. In our case, the enemy is invisible and might be present at every public Wi-Fi. Let’s check out some common threats associated with public Wi-Fis. If you believe that the Wi-Fi security protocols such as WPA, WPA 2 and WPA 3 are enough to secure your activities on the network, you couldn’t be more wrong. Past incidents have proved that these security protocols are not nearly as solid as they were once considered. Still if you have any doubts about it, read more about the KRACK Wi-Fi vulnerability. Cracking the weak security of a Wi-Fi network isn’t rocket science. After all, we now have free and paid tools available on the digital space that can allow even a non-tech Wi-Fi user to compromise the network and gain complete access to it. If you are a non-tech person, you would be never able to detect any hacking attempt, let alone a security breach. In fact, even tech-savvy users find it hard to identify a sneaky attack like MITM, aka Men-in-the-Middle attack. In this type of attack, the attacker gains access to the network and sits between two communicators, i.e. you and the Wi-Fi, to monitor your internet traffic and, in some cases, modify it. Hackers and snoopers know their way around vulnerabilities and network exploits. It is not hard for them to come up with ways to breach any network. One of the most common yet effective practices they use is the creation of fake hotspots. Hackers can create malicious hotspots that can monitor and record users’ data. Wi-Fi networks come by the dozen once you hit a food street, park and recreational or any other public spot. And since hackers know how desperate users are for free internet connectivity, they find it a great opportunity to lure in such users by creating a fake or malicious hotspot. On such malicious networks, the hacker can not only spy on the private activities of every user connected to the network but also modify the requests and damage in a lot of other ways. Therefore, it is always recommended to only connect to authentic networks. There are many clues behind a malicious or fake network such as a sound-alike network name but with a typo or any other letter missing or added. Moreover, you should always ask the staff for the genuineness of the Wi-Fi hotspot. Keep in mind that if you give hackers even a slightest opportunity to break into your device, they will. Automatic network sharing is one such opportunity that can result in a breach of your privacy. It can cause even more damage if you are not aware of the sharing that might have been set to open automatically when connected to a new network. Therefore, it is a must to check whether the network sharing feature is disabled or nor. Public internet hotspots are the least ideal networks for bill payments, banking transactions or online shopping. After all, we have discussed above the many dangers that come with such networks. So, always stay away from doing any privacy-sensitive work on a public hotspot. Since you can’t stop yourself from joining a free Wi-Fi and, of course who can, you can at least reduce the risk to zero by setting up a virtual private network, aka VPN on your device. PureVPN offers you both privacy and security-centric solution to all your problems, be it insecure Wi-Fi or other online threats. We reinforce the protection and anonymity of your data with our military-grade encryption, i.e., 256-bit AES encryption algorithm. So, whether you join the Internet from a home network, office network or a public hotspot, we assure you the integrity of your data and privacy of your internet activities. To double-up our assurance of highest-level security, we even offer a Wi-Fi dedicated feature, Secure Wi-Fi. You only need to toggle on the feature and go about your online activities on any network with complete peace of mind. Apart from data protection and confidentiality, you can also use our VPN service for several other purposes as well. For instance, you can spoof your location to access country-specific content or service. You can gain early-bird access to your favorite online games. Moreover, you can even book flights at a relatively cheaper price.